Antibiotics may be informally defined as the subgroup of anti-infectives derived from bacterial sources and used to treat bacterial infections. Antibiotics are used for treatment or prevention of bacterial infection. Other classes of drugs, most notably the sulfonamides , may be effective antibacterials. Similarly, some antibiotics may have secondary uses, such as the use of demeclocycline (Declomycin, a tetracycline derivative) to treat the syndrome of inappropriate antidiuretic hormone (SIADH) secretion. Other antibiotics may be useful in treating protozoal infections. Although there are several classification schemes for antibiotics, based on bacterial spectrum (broad versus narrow), route of administration (injectable versus oral versus topical), or type of activity (bactericidal versus bacteriostatic), the most useful is based on chemical structure. Antibiotics within a structural class will generally show similar patterns of effectiveness, toxicity, and allergic potential. The penicillins are the oldest class of antibiotics and have a common chemical structure that they share with the cephalosporins . The two groups are classed as the beta-lactam antibiotics, and are generally bacteriocidal—that is, they kill bacteria rather than inhibit growth. The penicillins can be further subdivided. The natural penicillins are based on the original penicillin G structure; penicillinase-resistant penicillins, notably methicillin and oxacillin, are active even in the presence of the bacterial enzyme that inactivates most natural penicillins. Aminopenicillins such as ampicillin and amoxicillin have an extended spectrum of action compared with the natural penicillins; extended spectrum penicillins are effective against a wider range of bacteria. These generally include coverage for Pseudomonas aeruginosa and may provide the penicillin in combination with a penicillinase inhibitor. Cephalosporins and the closely related cephamycins and carbapenems, like the penicillins, contain a beta-lactam chemical structure. Consequently, there are patterns of cross-resistance and cross-allergenicity among the drugs in these classes. The "cepha" drugs are among the most diverse classes of antibiotics, and are themselves subgrouped into first, second, and third generations. Each generation has a broader spectrum of activity than the one before. In addition, cefoxitin (Mefoxin), a cephamycin, is highly active against anaerobic bacteria, which makes it useful in prevention and treatment of infections of the intestines. The third generation drugs, cefotaxime, ceftizoxime, ceftriaxone, and others, cross the blood-brain barrier and may be used to treat meningitis and encephalitis. Cephalosporins are the usually preferred agents for prevention of infection during surgery. The fluroquinolones are synthetic antibacterial agents, and are not derived from bacteria. They are included here because they can be readily interchanged with traditional antibiotics. An earlier, related class of antibacterial agents, the quinolones, were not well absorbed, and could be used only to treat urinary tract infections. The fluroquinolones, which are based on the older group, are broad-spectrum bactericidal drugs that are chemically unrelated to the penicillins or the cephalosporins. They are well distributed into bone tissue, and so well absorbed that in general they are as effective by the oral route as by intravenous infusion. Tetracyclines got their name because they share a chemical structure having four rings. They are derived from a species of Streptomyces bacteria. Broad-spectrum bacteriostatic agents, the tetracyclines may be effective against a wide variety of microorganisms, including rickettsia and amebic parasites. Illustration by Electronic Illustrators Group. both to the stomach when given by mouth, or to veins when given by injection. Other classes of antibiotics include the aminoglycosides, which are particularly useful for their effectiveness in treating Pseudomonas aeruginosa infections, and the lincosamindes, clindamycin and lincomycin, which are highly active against anaerobic pathogens. In addition, other individual drugs are available that may have utility in specific infections. Dosage varies with drug, route of administration, pathogen, site of infection, and severity. Additional considerations include renal (kidney) function, age of patient, and other factors. Patients should consult manufac turers' recommendations or ask their doctors. Penicillins . Hypersensitivity may be common, and cross allergenicity with cephalosporins has been reported. Penicillins are classed as category B during pregnancy. Cephalosporins . Several cephalosporins and related compounds have been associated with seizures. Cefmetazole, cefoperazone, cefotetan and ceftriaxone may be associated with a fall in prothrombin activity and coagulation abnormalities. Pseudomembranous colitis (inflammation of the colon) has been reported with cephalosporins and other broad spectrum antibiotics. Some drugs in this class may cause renal toxicity. Pregnancy category B.
Fluoroquinolones . Lomefloxacin has been associated with increased photosensitivity. All drugs in this class have been associated with convulsions. Pregnancy category C.
Tetracyclines . Demeclocycline may cause increased photosensitivity. Minocycline may cause dizziness. Children under the age of eight should not use tetracyclines, and specifically during periods of tooth development. Oral tetracyclines bind to anions such as calcium and iron. Although doxycycline and minocycline may be taken with meals, patients are advised to take other tetracycline antibiotics on an empty stomach, and not to take the drugs with milk or other calcium-rich foods. Expired tetracycline should never be administered. Pregnancy category D; use during pregnancy may cause alterations in bone development. Macrolides . Erythromycin may aggravate the weakness of patients with myasthenia gravis. Azithromycin has, rarely, been associated with allergic reactions, including angioedema, anaphylaxis, and dermatologic reactions, including Stevens-Johnson syndrome and toxic epidermal necrolysis. Oral erythromycin may be highly irritating to the stomach and may cause severe phlebitis (inflammation of the vein) when given by injection. These drugs should be used with caution in patients with liver dysfunction. Pregnancy category B: Azithromycin, erythromycin. Pregnancy category C: Clarithromycin, dirithromycin, troleandomycin. Aminoglycosides . This class of drugs causes kidney and hearing problems. These problems can occur even with normal doses. Dosing should be based on renal function, with periodic testing of both kidney function and hearing. Pregnancy category D.
Use of all antibiotics may temporarily reduce the effectiveness of birth control pills; alternative birth control methods should be used while taking these medications. Antacids should be avoided while on tetracyclines as the calcium can impair absorption of this antibiotic class. For this reason, tetracyclines should not be taken just before or after consuming foods rich in calcium or iron. Consult specialized references for additional interactions to specific antibiotics. In severe infections, presumptive therapy with a broad-spectrum antibiotic such as a third generation cephalosporin may be appropriate. Treatment should be changed to a narrow spectrum agent as soon as the pathogen has been identified. After 48 hours of treatment, if there is clinical improvement, an oral antibiotic should be considered. When the pathogen is known or suspected to be Pseudomonas , a suitable beta-lactam drug is often prescribed in combination with an aminoglycoside. A single agent cannot be relied upon for treatment of Pseudomonas . When the patient has renal insufficiency, azactam should be considered in place of the aminoglycoside. In treatment of children with antibiotic suspensions, caregivers should be instructed in use of oral syringes or measuring teaspoons. Household teaspoons are not standardized and will give unreliable doses. Moellering, R. C., Jr. "Linezolid." Summaries for Patients. Annals of Internal Medicine 138 (January 21, 2003): I-44. Alliance for the Prudent Use of Antibiotics. Consumer Information. http://www.tufts.edu/med/apua/Patients/patient.html . "Using antibiotics sensibly." MayoClinic.com . February 6, 2002 [cited June 25, 2003]. http://www.mayoclinic.com/invoke.cfm?id=FL00075 . could you recomded us whihc is most comand used ? please give us an advise? PLEASE SEND ME THE LIST OF DIFFERENT ANTIBIOTICS & THEIR RESPECTIVE LIST OF SUSCEPTIBLE BACTERIA AND THEIR CORRESPONDING CAUSING BACTERIAL DISEASES. I'm making a project about the toxic effects of antibiotics, but I can't find information about the doses of antibiotics that can lead to toxic effects. I will appreciate every kind of help. Please write on my email as soon as possible. I want to be up dated with the latest antibiotics, doses and their use on infections. Dear sir/Madam, i am happy that you have this article!> it help us student to save our time in searching. what's the antibiotic should be used? I just want to know the side efct of taking antibiotic injection. 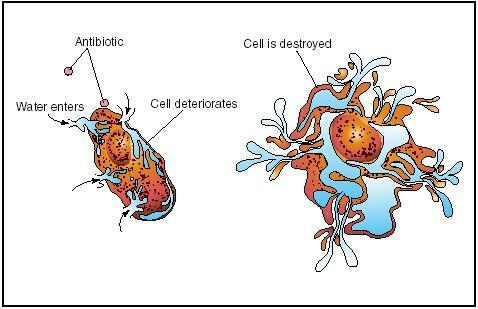 I am currently working on a project for my Microbiology class and am contacting you for your permission to use the above image for illustration purposes only. my names bob Marley if you don't know me i'm a rapper .